Maybe someone on your gift list has asked for Bible journaling supplies for Christmas but wasn’t very specific or may you want to start (or expand) Bible journaling but have no idea what to ask for. In either case here are my suggestions for Bible Journaling Gifts this year. A specifically designed Bible or a dedicated notebook is usually the best place for journaling. 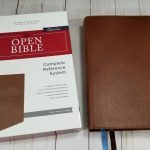 We have reviews of Bibles of every description but here are a few really nice journaling Bibles that released this year. This KJV illustrated journaling Bible has nearly 400 illustrations. 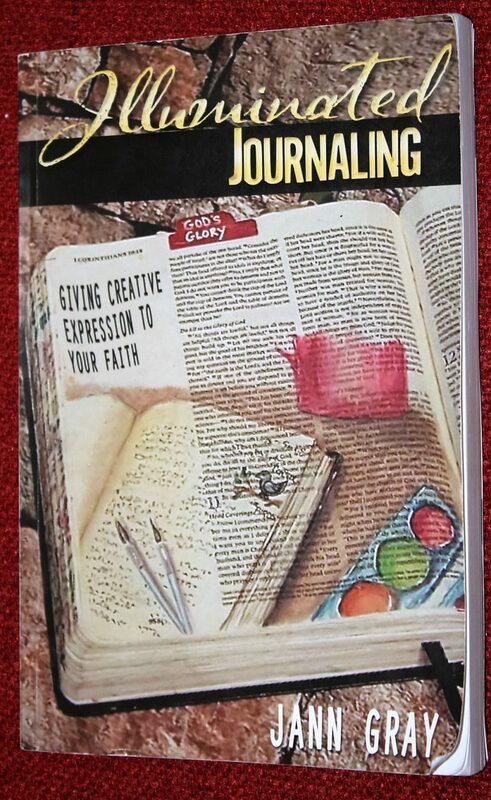 It’s theme of the promises of God make this an excellent choice for both new journallers and ones who already have a journaling Bible. 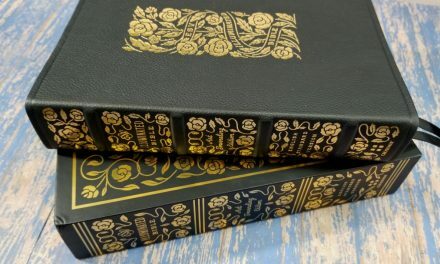 The promise theme is most evident in the book introductions that include promises from that book and the 52 themes that each have their own page of verses in the back. It is available in both a blue print and pink print cover. To continue their popular Inspire line Tyndale has released the NLT Inspire Praise Bible. 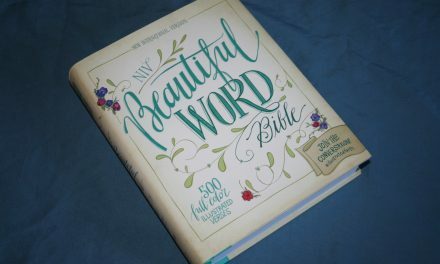 With over 500 illustrations, beautiful color inserts with praise verses and thick, nearly white pages this is sure to be a favorite Bible of many. This would be an excellent choice especially for those who have almost filled their original NLT Inspire Bible or whose favorite color is purple. The ESV Illuminated Bible, Art Journaling Edition has over 500 gold ink illustrations by artist Dana Tanamachi in a vintage inspired style. It’s a modern take on the illuminated Bibles of the past available in four covers from hardback to premium leather. Since you’ll be adding your journaling to the wide margins in addition to the finished artwork it would make a nice Bible for those who journal primarily with words as well as those who use pictures. The She Reads Truth is a really nice Bible that combines features for studying, journaling, and devotional time. It has illustrated verses, maps, timelines, devotionals by Amanda Williams and Raechel Myers and more. It’s wide margins would be perfect for responding to God’s word in. The paper is a bit thinner than most journaling Bibles so it will be best for those who don’t use a lot of wet mediums unless they are also comfortable with using gesso. There were not a lot of new non-illustrated journaling Bibles released this year but there are a couple that always make good gifts in your recipient prefers blank margins. The ESV Journaling Bible Interleaved Edition (Buy from Amazon | See Review) is a long time favorite. 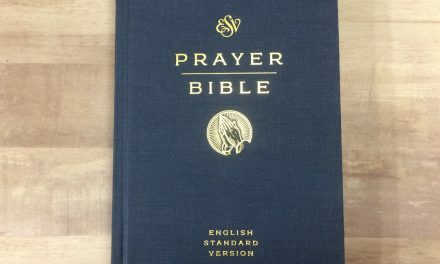 The only interleaved Bible on the market it’s full blank page for every page of Bible text makes it an excellent choice for those who want to make their own charts, lengthy notes, or large artwork. The Journal the Word Bible (Buy from Amazon | See My Review, Randy’s Review) is another excellent choice. It has the wide margins, thick paper, and single column format many prefer in a journaling bible as well as the word’s of Christ in red. What makes this such an excellent choice for gift giving though is the wide selection of options beyond the basic features. It comes in three translations (KJV, NKJV, and NIV), two sizes (standard and large print), and multiple cover options. With so many choices it should be easy to find a version of the Journal the Word Bible for almost anyone on your Christmas list. You might also want to check out last year’s post Journaling Bibles for Christmas. I think books make great gifts so of course I have to add a few to the possibilities for Bible journaling gifts. 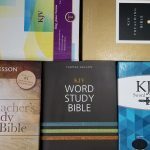 Here are a couple of my favorites books about the whys or hows of Bible journaling that are new this year. 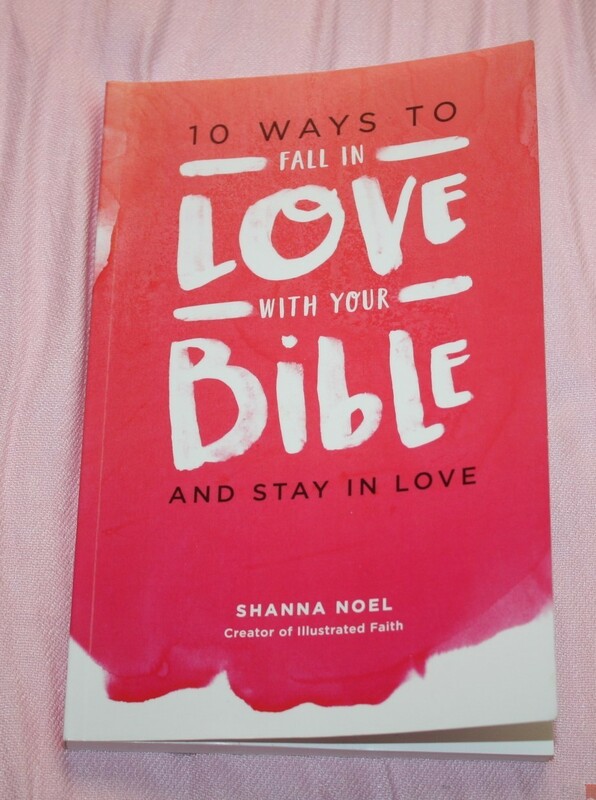 10 Ways to Fall in Love With Your Bible is the story of Shana Noel’s (of Illustrated Faith fame) journey to finding a method of Bible study that worked for her. With lots of quotes and questions it will help you make the same journey. 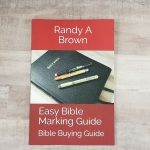 It is especially useful for those who want to start a habit of Bible reading, improve the quality or consistency of their Bible reading habit, or those trying to figure out if they want to start Bible journaling. While legacy journaling is the main focus of the Stones of Remembrance Series any one who art journals is sure to find a lot of useful information in it. A legacy Bible is one way to help pass your faith to the next generation. The main book will walk you through the “whys” and the “what to journal” portion of creating one while the workbook deals more directly with the “hows”. The coordinating One and Done set will make getting started easier for those you doubt their artistic ability. The Art of Words is currently my favorite lettering book. Valerie Wieners has include lots of useful instruction, practical applications, and beautiful inspiration in this book. If you or someone on your Christmas list wants to learn hand lettering with a scriptural focus this book is a great place to start. Bible journaling is very poular and several books have been released this year that prove that. Among them are Complete Guide to Bible Journaling by Joanne Fink, Faith Journaling for the Inspired Artist by Stephanie Ackerman, The Art of Bible Journaling by Erin Bassett, and Lettering for the Lord from Lettering Designs. While I haven’t seen any of these four books in person they were contributed to and/or recommended by various journalers I follow. 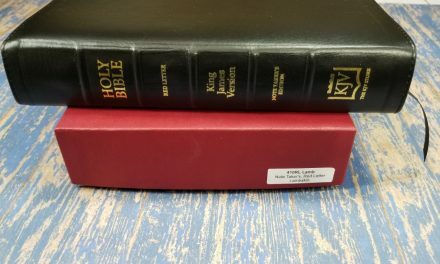 We haven’t done a lot of journaling supply reviews or articles on Bible Buying Guide yet (something we are hoping to change over the next several months) so this list is a bit different. There are so many options and so many different styles of journaling it’s hard to make recommendations. In general a new or expanded set of something similar to the products they already use or a beginner’s (artist grade) set for a art medium they have been wanting to try will be the most appreciated. Pens are the only essential supply for everyone who journals. You should be looking for something that will work well with Bible paper. Some people once they have found a brand they like will be reluctant to try something new so keep that in mind. The brands of pens I see recommended over and over again (most of which I’ve used) are Sakura Pigma Microns, Illustrated Faith Precision Pens, Faber-Castell Pitt Pens, and Tombow Fudenosuke Brush Pens. This is one place brand really does matter. Something similar made by someone else has a higher chance for show through or even bleed through. When writing in a Bible it’s always best to be careful since any pen can bleed if you hold it against the paper long enough in the same spot. This pen set, the PenEssentials Bible Journaling Cube – 17 piece kit, is at the top of my Christmas list this year. It contains a wide variety of Bible friendly pens from Sakura, a see through ruler, and a brush lettering guide. Among the pens are 4 different tips of black Pigma’s, gelly rolls, souffle pens, a white paint marker, and a gold and a black calligraphy pen. (I’ve been looking for Bible friendly calligraphy pens since I started). 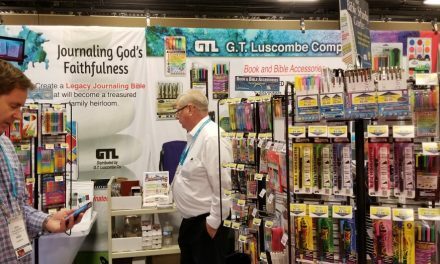 The GTL on the package stands for G. T. Luscombe, a distributor that specializes in finding products that work well with Bible paper. Their products are commonly found in Bible bookstores but wherever you find them any of their products should work well in most Bibles. Sets, kits, items with favorite themes, and items you think they would like but are reluctant to buy themselves tend to make the best gifts. Here are a few frequently asked for (and about) products. Colored Pencils – This is one art supply where brand doesn’t matter much at all. In general cheaper pencils color slightly lighter and are harder to break while more expensive brands blend easier but are more difficult to sharpen to a fine point. All of them (as far as I know) work well in Bibles. My personal favorite is the Prismacolor Pencils. They are on the blend beautifully but breakable end though you can buy their Verithin product for when you need crisp lines. This 23 piece set is really nice for true beginners since it has 18 soft and 5 verithin. It will give you a chance to see which is preferred. Journaling Kit – One good gift option is always a kit. The three main types of kits available are beginners kits, specific medium or technique kits, and kits that have several different products coordinated by theme and color. Dayspring has probably the most well known kits. They have a couple different ones for beginners, their popular monthly kits (1 to 6 of the previous months kits are usually available), and a new line of kits with coordinated items from their themed lines of products. GT Luscombe has produced a lot of nice journaling kits for both written and art journaling. Etsy is another source for craft supplies. CreativeBeauUK and theHappyMarigold had my favorite kits there. I’m always on the look out for more journaling supplies so if anyone knows of another good source for kits please let me know. Gesso – If you (or the person your buying for) is nervous about bleed through or plan to use wet products like alcohol ink pens or juicy ink pads you probably want to invest in gesso. Gesso is a page prep and sealer and comes in a huge variety of types some of which won’t be suitable. Art Basics Clear Gesso or Dina Wakely Clear Gesso are the only two I recommend for Bibles. Both are thin and smooth with fairly even coverage. A pack of paint cards or mini ink blending tools (my preferred method) for applying the gesso would be nice gesture. Bible Mat – A Bible mat is one of those not strictly necessary but handy to have things that makes a nice gift. Their purpose is to add stability and prevent indenting and bleed through while you work. A small stack of copy paper or a couple sheets of wax paper can be used but an actual Bible mat will be more durable. The two I have are the Illustrated Faith Bible Mat and the Ranger 15×18 Inkssentials Craft Sheet. The Illustrated Faith one provides more stability and has a built-in ruler that is really helpful with spacing sometimes. The Ranger one is larger (can be cut to give you 2 mats for a standard size Bible), works better with heat, and cleans quicker. Watercolors – Being easy to blend, useful for putting down lots of color fast, and having surprisingly little bleed through (if you don’t use too little or too much water) make this a favorite supply for many journalers. If you avoid Crayola and other kid’s brands sold at big box stores and get even the cheapest artist grade set at the art supply store you’ll be much happier. (My Crayola brand bleed even through gesso and my inexpensive Artist Loft set is slightly chalky but I’ve never had any problems that weren’t from inexperience). I love my pearlescent watercolors and I know of many journalers who use Koi brand, Illustrated Faith’s Pebeo brand, and Gansai Tambi watercolors with great success. I’m considering one of Prima Marketing’s five different Watercolor Confections sets for my next watercolor purchase. Acrylic Paints – Full body acrylic paints (the ones in tubes not bottles) work well on Bible paper. They stay on top of the paper instead of soaking in and even create a barrier so you can use your highly likely to bleed markers and inks on top of them with no worries (Just make sure the paint is fully dry if you want to keep your marker tips in good shape.) I have this Memory Brand Set (because they were marketing it as being great for Bible journaling at the time) and I know of artists who use Pebeo brand, Liquitex, and many other brands. Gelatos – Faber-Castell Gelatos are one of my favorite mediums. They come in tubes that look a bit like lip gloss tubes and are a creamy product that can be used with or without water. They don’t bleed through Bible paper at all but for a background I prefer to use them on top of gesso because they blend better. I also frequently rub them through stencils and use them mixed with a bit of water as paint or as ink for my stamps. They come individually or in sets and Faber-Castell even makes a Bible Journaling Kit. I have the Metallic Set and have put the Pastel Set on my Christmas wish list. 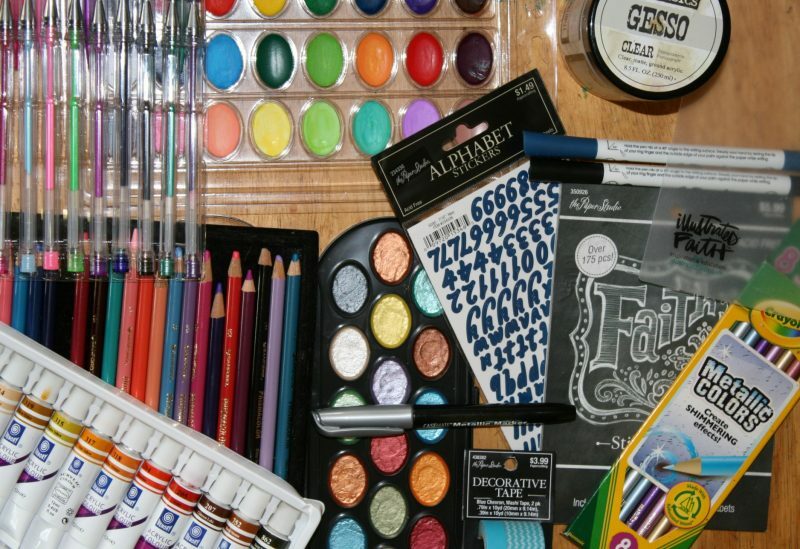 Other products – When it comes to art supplies I’ve only barely begun. The possiblities for Bible journaling gifts is huge. Tabs, bookmarks, and tab cutters are popular among Bible journalers. Scrapbooking supplies like washi tape, stickers, and paper pieces are commonly used. Supplies that help you get images onto the paper that don’t require you to be an artist are frequently good choices. These include stencils, stamps, and traceables like Jann Gray’s “One and Dones” and ClickPrints. All of these are available in Bible specific options but you don’t have to limit yourself to those. Geometrics, flowers, animals, and any favorite theme are also good choices. Other forms of adding color that are Bible paper friendly (like watercolor pencils and Derwents inktense products) are also possibilities. These products can be found not only at the three main stores I’ve linked to but at many art and craft supply stores and local Bible bookstores with an art journaling section. Whatever Bible journaling gifts you decide on I’m sure the person you are buying for will enjoy reacting to God’s word in a creative way with the products you gift them.